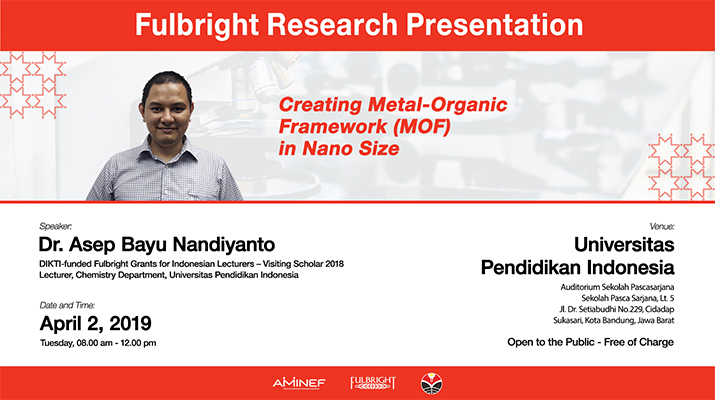 by Dr. Asep Bayu Nandiyanto, 2018 DIKTI-funded Fulbright Grants for Indonesian Lecturers – Visiting Scholar, on April 2, 2019, at 08.00 – 12.00 at Universitas Pendidikan Indonesia, Bandung, West Java. Asep Bayu is an associate professor in Chemistry Department at Universitas Pendidikan Indonesia. He received DIKTI-funded Fulbright Grants for Indonesian Lecturers – Visiting Scholar Program in 2018 to conduct postdoctoral research at Virginia Commonwealth University on the abovementioned field. He received his master’s and doctoral degree in chemical engineering from Hiroshima University, and bachelor degree in the same field from Institut Teknologi Bandung. His research interest is in the area of particle technology, specifically the production of fine particles and their applications. He has published 9 patents and copyright, 4 books, 3 book chapters, 2 review papers, 32 peer-reviewed scopus-indexed proceedings, and more than 50 refereed scopus-indexed journal papers. He has received more than 10 awards, among others the Society of Chemical Engineers Japan Award for Outstanding Young Researcher in 2013 and the George Klinzing Award from American Institute of Chemical Engineer in 2014. In materials world, one of the most unique materials is metal-organic framework (MOF). It is unique because it is porous and has a wide surface area. However, it usually comes in a size up to millimeter. This research is trying to create a smaller MOF size down to nanoparticle. The main reason is to achieve better performances, both in sizes and properties such as surface area and porosity to be able to save more gas, absorb more particles, filter more molecules, activate site and catalysis area (a special area in chemical reaction), and so on.